Manti Te’o’s lackluster performance against Alabama in the national championship game is now explained. In a twist worthy of a Twilight Zone episode it turns out that Te’o, the Notre Dame stand-out, was the victim of a hoax girlfriend, a faked death and a professional scam perpetrated for no other reason it seems than to embarrass and seriously wound an outstanding young man. The media is having a field day, especially the anti-Notre Dame shills. ‘Lying Irish’ is just one headline from The New York Post today. I have just watched the entire press conference that Notre Dame Athletic Director Jack Swarbrick gave in South Bend and my head is spinning with the tale of deceit, lies and cold blooded callousness he revealed. Much and all as we think a fake girlfriend would be an impossible trick to pull off, the fact is that online personas, avatars, and disguises are the stock in trade of millions of hucksters on the Internet. We open our online accounts every day and there are a flood of such bottom feeders trying to inveigle their way into our lives. In the case of Te’o they succeeded and in the process have created a sensational outcome that will deeply embarrass Notre Dame and all who sail with her. Te’o’s only crime appears to be that he was so trusting that he was duped from day one in September 2011 when a woman masquerading as a Stanford student who was a big fan of his contacted him via Twitter. Over the next 14 months or so it appears they carried out an intense online and telephonic relationship. According to Swarbrick, there was a cast of characters who kept the dupe Te’o narrative going, an unbelievably cruel and sophisticated hoax. The girl even came with a family, different characters who were introduced to Te’o who was obviously seriously smitten, strange as that may sound. Or maybe not. People are smitten every day on the Internet by perfect strangers. Much of it is real, much of it is imagined. In Teo’s world the distant girlfriend became a constant presence. As Swarbrick pointed out the scam was based closely on a documentary called ‘Catfish’ about this phenomenon of reeling in an unsuspecting person by virtue of a fable carefully constructed. What possible enjoyment there could be from such a scam is hard to see but any scroll through the Internet reveals trolls and other evil people ready to do their worst. Just yesterday there was a series of articles about one of the heroes of the Sandy Hook shooting , a man who took in several of the panic stricken children who fled the school, being abused anonymously online. Such is the world we live in and we should not be surprised when a major figure like Te’o, clearly way too trusting for his own good, was roped in to a scam. 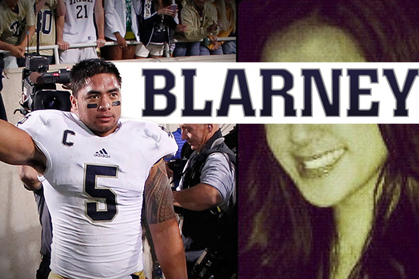 It is deeply embarrassing for Te’o and for Notre Dame. One can only imagine what Coach Brian Kelly was thinking when he was informed of the hoax days before the biggest game of his life. But the real victim here is Te’o, a young man caught in the full glare of the media headlights and revealed as naive and far too trusting. People will ask how come he never demanded to meet her and apparently several planned encounters were canceled at the last moment. Those should have been warning shots for Te’o but he won’t be the first or the last fool in love to construct his own reality around events despite glaring holes in the story. What satisfaction these bottom feeders got from their hoax I do not know but it is a sad reflection on our modern world that such people exist and thrive. I hope for Te’o and Notre Dame’s sake he can put all this behind him and be the great NFL player he is destined to be. Just when you think you have seen it all a story like this comes along. Sadly, it is a truly a reflection on the times we live in.